Assembly fixtures are required for many applications - Usually to restrain detail parts or sub-assys. to ensure I.C.Y. repeatability and consistency of build. Jigs are either designed by our engineers in-house or made to released drawings and CAD. Fixtures can either be bench-top, or site levelled and inspected / calibrated using Faro Arms or Laser Trackers depending on the size and the accuracies required. Aircraft Sub. Assy. Build Fixtures PORT / STBD - Fixturing. Complex - Build Sub. Assy. and Drill Fixture - Features incorporated due to jig-lock (sliding / swing-over locations). U.A.V. 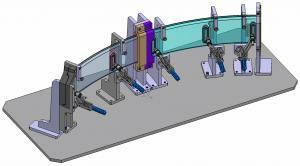 Unmannned Aviation Vehicle - Wing Bonding / Assy Tooling.